Young males between 14-24 are notoriously hard to get through to. At best, communication is likely to involve some grunts and whining and a general air of non interest. Statistically as well, these individuals are the most prone to mental health problems and with todays increasing reliance on social media to provide validation amongst peers, they're at a greater danger of self abusing or getting into difficulties with drugs or alcohol. 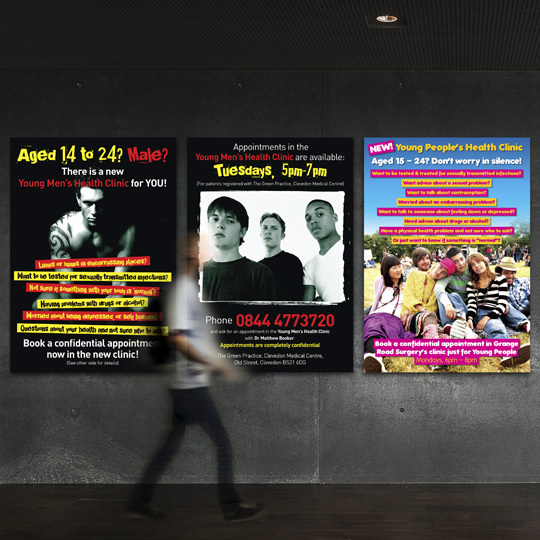 With this in mind we designed these young men's health clinic flyers, which were also blown up to poster size, using moody atmospheric images of 'yoots' and styled the text in a cut-up punk style, in an effort to reach the troubled whipper snappers. Following on from the success of these in the clinic, we were asked to design some flyers for young people focussing on sexual issues and body concerns that might be embarrasing. We used some festival friendly youngsters on this one who may or may not be riddled with Chlamydia - you just don't know so why risk it, use a condom!